The lobster season in Maine is over for the year. Those tasty crustaceans get a break for the holidays — and a chance to grow and replenish before next year’s season rolls around — and as a result the Maine countryside is awash in yellow. 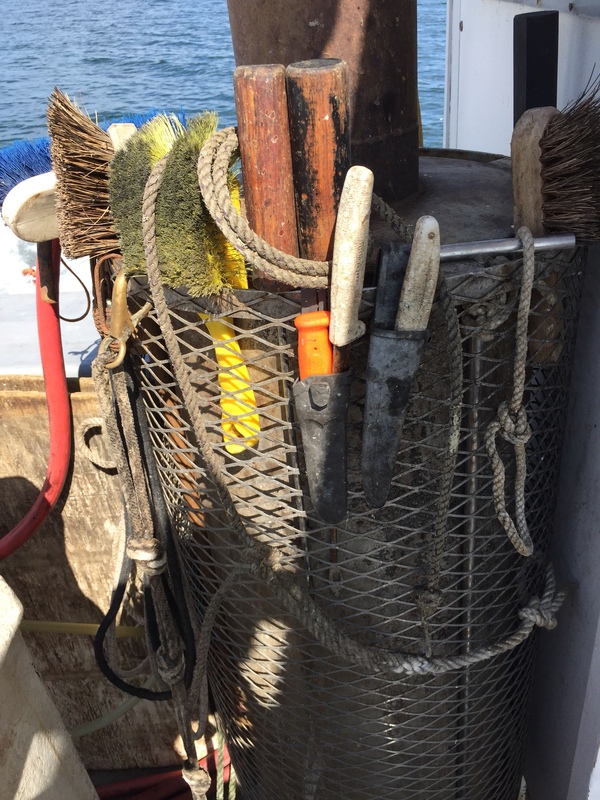 That’s because the old-fashioned wooden lobster traps you see in some seafood restaurants have long since been replaced by these bright yellow, metal traps, which are a lot more durable. The traps are all removed from the water during the off-season and are stacked just about everywhere. Maine lobstermen and lobsterwomen work very hard, even during the off-season Along the coast you see enormous pick-up trucks, the lobster fisherman vehicle of choice, carting mounds the yellow lobster traps from dockside to workshop, where they will be examined, one by one, and repaired over the off-season. Our neighbor here has 500 of the traps, which he says is the legal limit. The traps are neatly stacked on pallets, and he uses a front loader to maneuver them into his workshop for repair. They’ll keep him busy this winter. Psst! 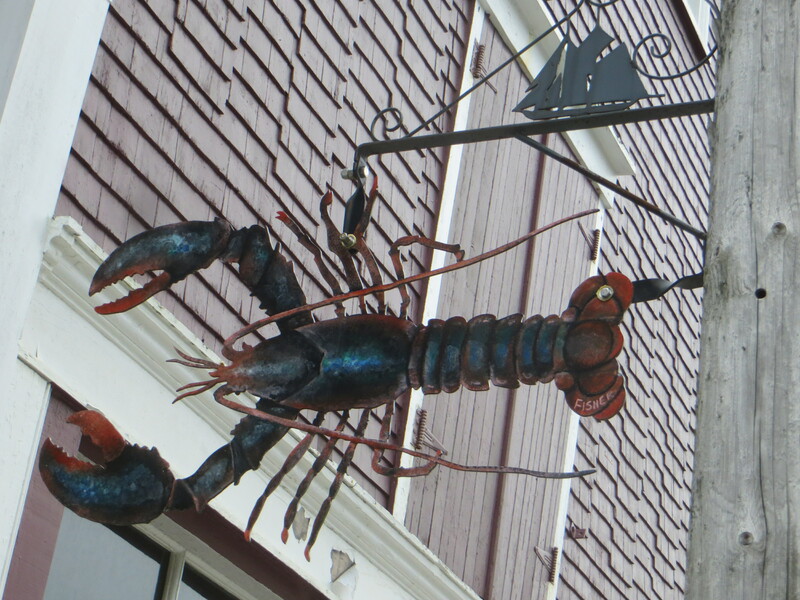 I’ll let you in on a well-kept secret: Maine has really excellent fresh lobster, in abundance. No, seriously! It does! And I have enjoyed it at just about every meal. I’ve had lobster and eggs for breakfast. I’ve had a lobster roll — lobster meat on a split-top hot dog bun — for lunch. (The Fish Net in Blue Hill makes the best one.). I’ve had baked lobster, boiled lobster, and steamed lobster. I’ve bought live lobsters directly from a lobsterman. 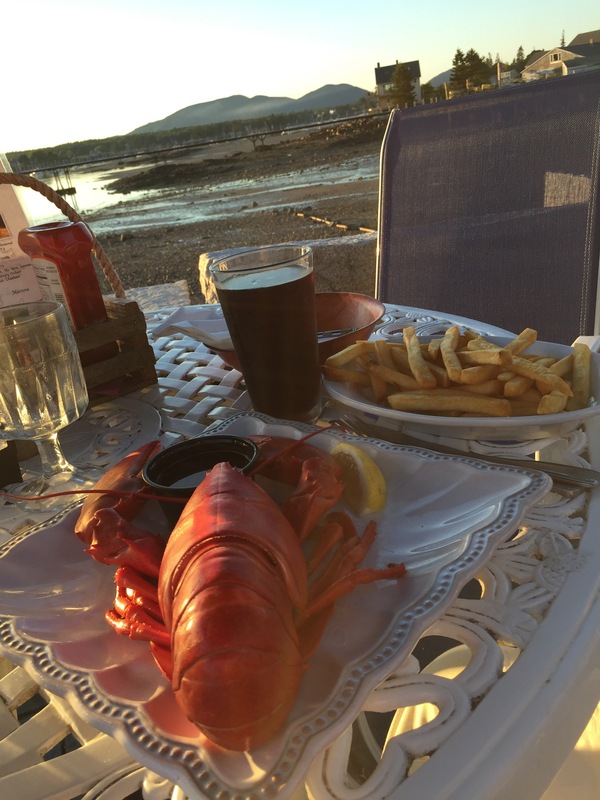 I’ve eaten lobster on a beach where we’ve recycled the remains to the denizens of the deep. And, for my first boiled lobster of the trip, I foolishly failed to bib up and ended up coating my shirt with water and lobster innards with the first crack of the claw. 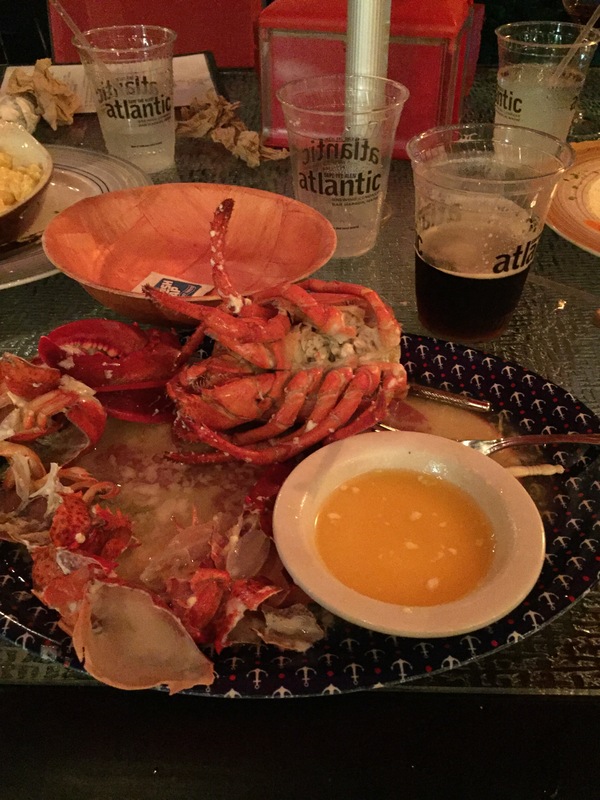 After so much lobster, I’ve got just one question: how much lobster do you need to eat to risk a bout of gout? 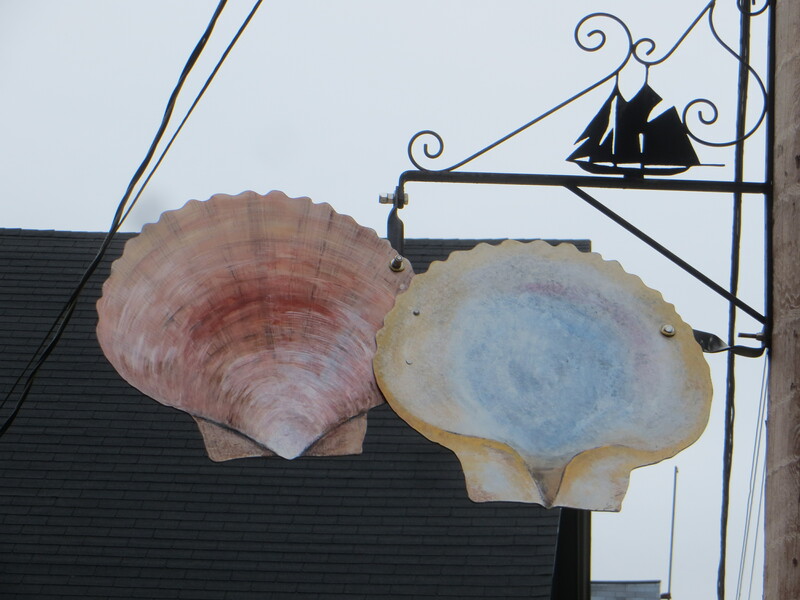 One of the cooler things about Lunenburg, Nova Scotia is that the town features appropriate artwork at every intersection. 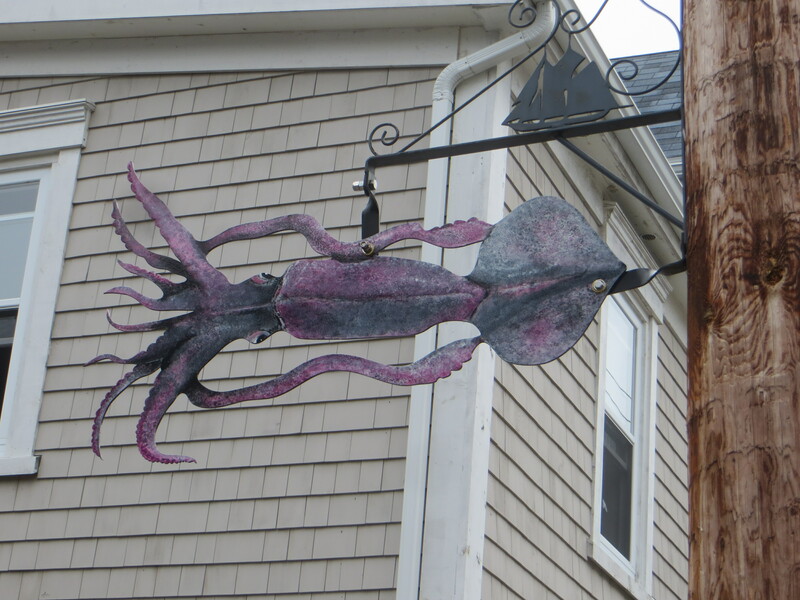 An artist has prepared very fine depictions of fish, clams, lobster, squid, and other denizens of the deep that hang at the crossing signs along the main road in town. 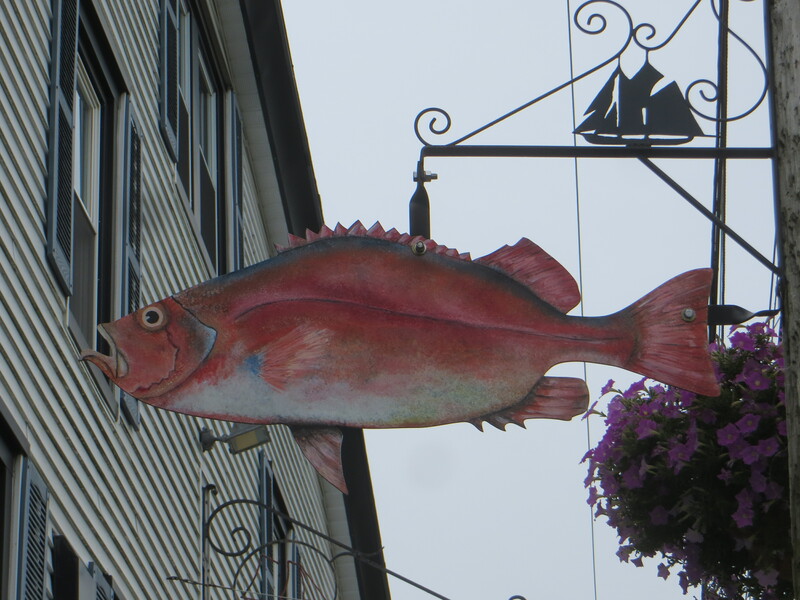 I don’t know a cod for the halibut, but I do know that marine life artwork definitely gives the town the feel of a seaport. I’ve attached a few of these fishy signs for everyone to enjoy.